Guys. These socks. I keep making mistakes on them! I promised they would be done in February and there's still a chance that they will - after all, there are four weeks in February and isn't it a leap year? But honestly. How can I be making so many mistakes in this one pair? 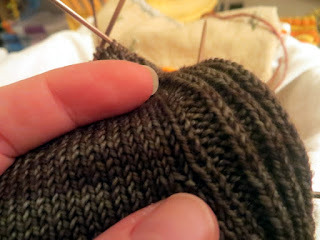 Am I really that out of practice with darker yarns? I've had to start keeping a crochet hook in the bag I carry them around in, just to save time on laddering the rows back up after I've dropped to the problematic round. Someday, I swear, I'll use a crochet hook for actual crochet. I came across some pretty crochet stitch books when I was sorting things out back in January - yes, I kept them - and also Jan is doing a lot more crochet lately. I've known her for many years without ever catching her at that, but she has a grandson now, so there are blankets to be made. There's nothing like a blanket for a special new baby, right? And all babies are special. Plus last time I saw her she had a crocheted cowl on. Maybe I'll ask Jan to meet me for crochet and knitting and something hot to drink. Maybe her crochet magic will wear off on my knitting karma and I will get these socks to the toe without further error. 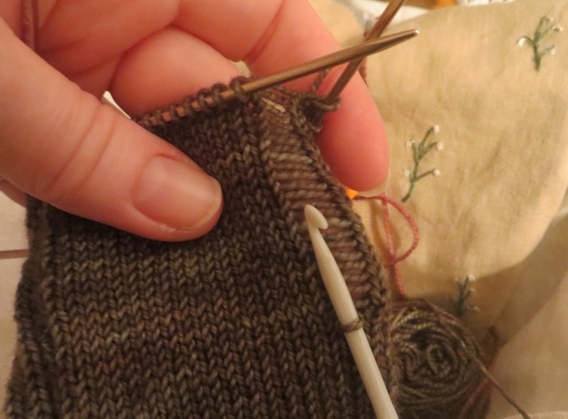 The toes will be in red with no ribbing at all so I'm pretty sure once I'm there, I'm home free. And wouldn't that be nice? Hope you have something happy lined up to enjoy working on today, and if not, that you arrange one! Take care and I'll see you tomorrow.